I have long wanted to get back to my original weight, 7 lbs. 9 oz. but I’m finding it difficult. Regardless, recently I purchased a Fitbit Charge HR digital tracker to monitor the exercise I get and, shortly afterward, a Fitbit Aria electronic scale. I won’t say I’m actually part of the #QuantifiedSelf movement, but I do like data and find they help me achieve goals by showing me how I’m doing and the consequences of not following the steps needed to accomplish them. Last Friday marked two very important milestones in my quest to get in better shape and, more importantly, to reach a point where I can either stop taking the two maintenance drugs I’ve been on for quite some time (for essential hypertension and type II diabetes). I test my blood sugar at least every morning and Friday, for the first time in my memory of the last over 15 years, it was under 90 upon arising. This is very unusual for me as I have always experienced an early morning spike in my readings. I’m also weighing myself each morning as soon as I get up. 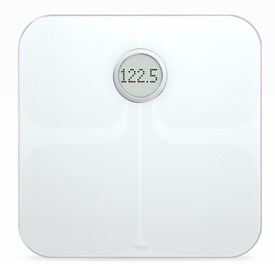 The Aria scale measures weight and body fat percentage. After I stand on the scale and it settles, it shows me my weight, body fat %, and my initials (it will recognize up to eight people) twice, then syncs the data via our wifi to my Fitbit account. This morning I dipped below 180 lbs. for the first time in decades. Over the weekend I indulged a wee bit and this morning my weight was just over 180, but my blood sugar was 89. My average before meal reading is now about 110, an amazing difference from what I’m used to. Last time I had an A1C test, I had dropped below the threshold of 7.0 and I’m quite certain it will be even lower this time. I suppose I could have achieved this a long time ago, but I didn’t. Better late than never, eh?